2016 has been an amazing year for first-person shooters, and it’s safe to say that the bar has been raised for the genre. This year has seen Overwatch expand the reach of the genre, DOOM reinvent itself as a relevant series, and solid entries in staples like Call of Duty, Titanfall and Battlefield. 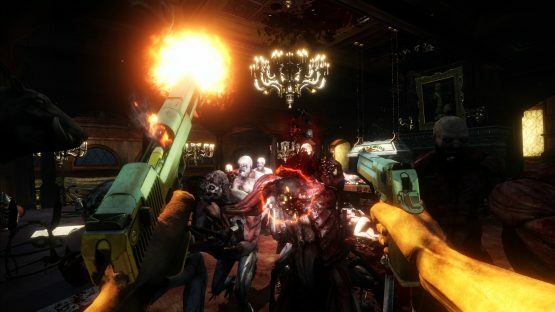 This puts Tripwire Interactive in an awkward situation as their co-op focused FPS Killing Floor 2 now has to compete for players and their time. Thankfully, the game is up to the task as the gunplay in Killing Floor 2 feels really good. A large part of this is due to the game having a slight auto-aim enabled for console players. While this can sometimes feel awkward in other shooters, it feels great here since the crosshair is pretty wide on the screen. This meant that I was able to headshot one of the dozens of zombies chasing after me by aiming in their general direction, and it kept the combat feeling fast. I never really had time to line up a direct shot and that’s largely due to the game’s combat encounters relying on sheer size. Killing Floor 2 is a wave-based survival game where up to six players work together to survive enemy onslaughts. Depending on the size of my crew, it wasn’t uncommon to see well over 100 zombies coming my way. Facing off against a crazy amount of enemies would’ve been really impressive 10 years ago, but games like Dead Rising and Dynasty Warriors have already used this idea to varying degrees of success. Sadly, it feels like this design choice is used to cover up the fact that none of the combat scenarios are ever interesting. There isn’t any sense of progression or variety in the hordes that arrive, just more nameless enemies to shoot in the face. Matches can last anywhere from four waves on the shortest setting to 10 at the max, but all the length changes is the amount of blood you’ll have to spill in order to progress. The game doesn’t add mid-bosses into the mix during a longer session (correction: there are in fact mini-bosses, they just are part of the normal waves themselves and don’t stick out), nor is there any added sense of story in a longer gameplay session. No, it’s simply longer and that’s not a good thing considering I grew tired of shooting waves of zombies after a few hours. The biggest issue that Killing Floor 2 suffers from is that there just isn’t more to the experience. Every match culminates in one of two boss fights, where players have to battle an overpowered enemy who can kill a player in a few seconds if their attacks land. Early on, this really sucked as almost every match ended in failure (if you die, you don’t respawn until the next wave) after easily getting through the initial waves. At first I thought the game was just really difficult, but it was actually just due to the game’s terrible progression system making these fights seemingly impossible until players grind. See, in Killing Floor 2 players have to pick a perk that they’ll level up. I chose berserker, which was good for up-close combat, and once I had leveled up my character to rank five (which took several hours of play) I unlocked a new ability that raised my health by 75%. Once my group of friends had leveled up and equipped abilities, the bosses became just as easy as the waves that prefaced them. They were only hard because of the game restricting the player, forcing them to grind. There are only two modes in the game: survival and survival versus. 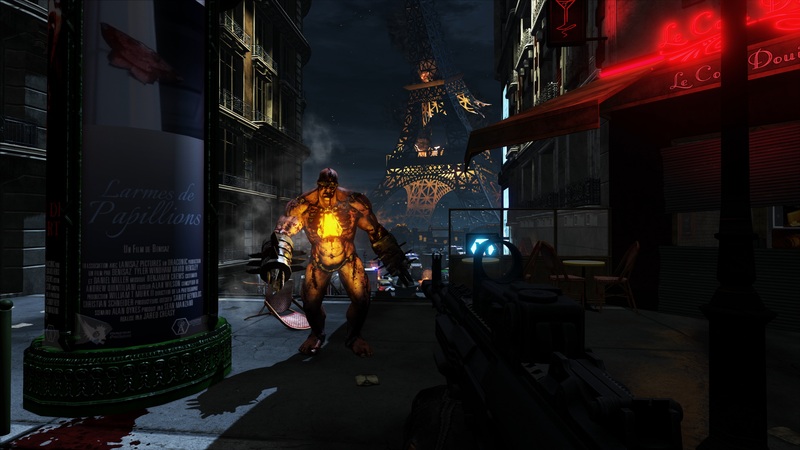 The former mode has up to six players going up against waves of enemies, while the latter is the only form of competitive multiplayer that the game offers. Versus feels a lot like Left 4 Dead‘s multiplayer, as one side will spawn as rare forms of zombies that have special abilities and they have to kill players that are trying to play the game like you would in survival mode. I actually enjoyed this mode more than the default way to play, just because there was some semblance of variety going on. That said, I didn’t find any of the special zombies (or Zed as they are called in-game) fun to play as. The zombie combat all takes place in third-person, and it feels way clunkier than the responsive first-person shooting. No matter if I was using a fat zombie that puked on enemies or a fast one that was invisible, it never felt great. Those two middling modes are all the game has to offer. The wave-based survival isn’t nearly as fun as Gears of War‘s horde mode and the competitive play is clunky. I was surprised to see that there weren’t any competitive modes that let players go against each other with guns blazing, but it doesn’t really matter since games like Titanfall would still be a better use of time. If there was something more original here, then maybe the novelty would last longer, but I got bored of shooting wave after wave of zombies rather quickly. Killing Floor 2 doesn’t bring a single original idea to the table, nor does it present them in an interesting way. It’s like Left 4 Dead without the actually interesting mechanics and if the focus was strictly on shooting zombies. It’s a game that I probably would’ve loved when I was 10, and didn’t mind doing the same task repeatedly in games, but this is an M-rated game and my taste has changed for the better. Review code for Killing Floor 2 provided by publisher. Reviewed on PS4 Pro. For more information on scoring, please read our Review Policy here.